The 122mm 40-tube multiple launch rocket system Grad (Hail), with a firing range of up to 20 km, was introduced into operational service with the Russian Army in 1963 [and initially designated in the West as the M1964]. The BM-21 is unquestionably the world�s most widely used MRL. The successful use of the Grad system in local conflicts of various intensity for three decades led many countries to develop similar systems. The launcher with supporting equipment is referred to as the complex 9K51. This 40-round launcher has four tiers of ten tubes mounted on the chassis of a truck. The BM-21 can be distinguished from other multiple rocket launchers by the square-cornered, 40-tube launching apparatus (4 banks of 10 tubes), which is often covered by a protective canvas. It is mounted on the Ural-375D 6х6 truck chassis, which has a distinctive fender design and a spare tire on the rear side of the cab. 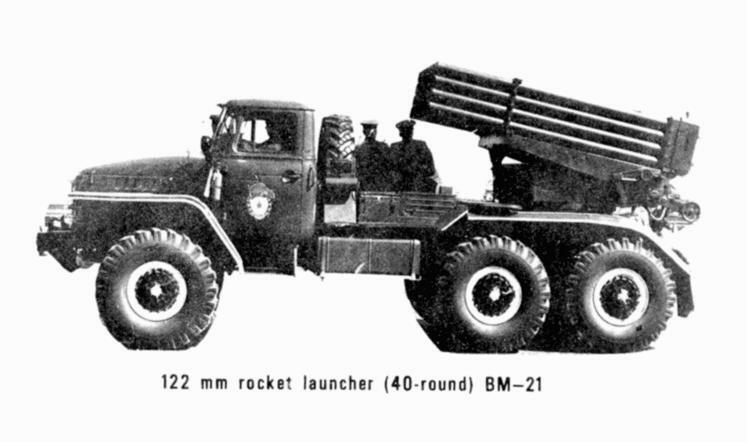 The BM-21 also is the only known Soviet rocket launcher without blast shields on the driver's cab. However, the material used in the cab windows and windscreen is strong enough to withstand the overpressures and other effects associated with the firing of 122-mm rockets. The BM-21 can be operated and fired from the cab, or it can be fired remotely at a distance of up to 60 meters, using a cable set. 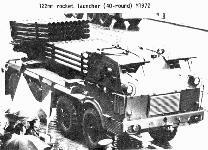 The launcher is traversed forward towards the cab for traveling and for firing uses two stabilizing jacks at the rear of the vehicle. A special electric generator powers the launcher. The 9V170 firing device is cab mounted, but the rockets can be fired using a remote-firing device that has a 64-meter-long cable. This MRL can fire all rockets in 6 seconds or fire each singly, and can reload in 5 minutes. It can fire the 40 rockets or any part thereof at a fixed 0.5-second interval. Single rockets can be fired manually at any desired interval. The five-man crew can reload the launcher in 8 minutes. The BM-21 fires a "9-ft rocket" with a range of 20,380 meters. Each launch tube is grooved to impart a slow rotary motion to the rocket. However, the rocket is primarily fin-stabilized. This combination of spin- and fin-stabilization ensures closely grouped fire at ranges of up to 16 kilometers. 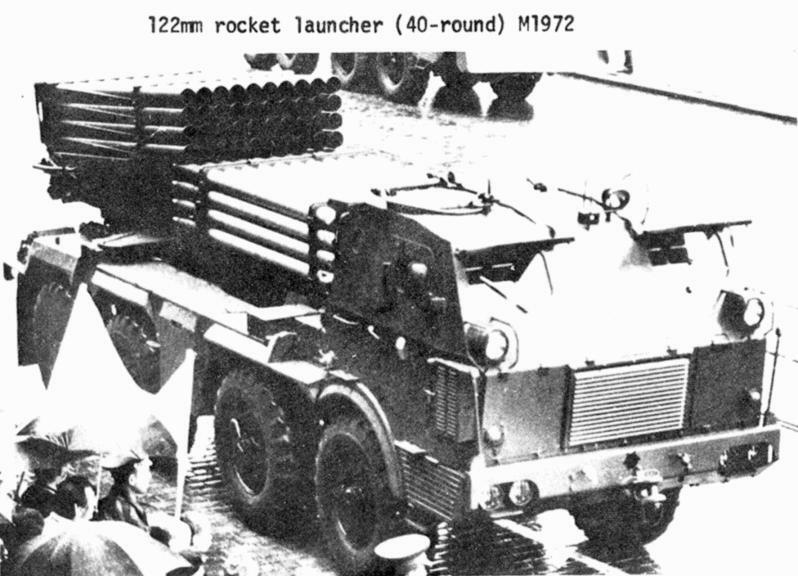 The BM-21 and other 122mm rocket launchers can fire all 122mm rockets designed to fit in Soviet-derived 122mm launchers (including those that can achieve ranges of 30,000 to 36,000 meters). The 122-mm fin-stabilized rockets can deliver Frag-HE, chemical, or incendiary warheads to a range of over 20 kilometers, or the newer HE and cargo rockets out to 30 kilometers. On explosion, the warhead produces a great fragmentation effect and shock wave. Because of its high volume of fire and large area coverage, the BM-21 is well suited for use against troops in the open, for use in artillery preparations, and for delivery of chemical concentrations. One volley from a BM-21 battalion is 720 rounds. Because these weapons have a large circular area probable (CEP), they are not suited for attacks against point targets. The Ural-375D vehicle has a maximum road speed of 75 km/hr, a cruising range of 750 km, and an exceptional cross-country capability. Rockets must always be fired with the vehicle parked obliquely to the target to avoid blast damage to the unprotected cab. The BM-21 entered service in 1964 as a replacement for the 140-mm (16- and 17-round) BM-14 rocket launchers, and is now the most widely used truck-mounted rocket launcher in the Warsaw Pact forces. Heavier rocket launchers, including the 200-mm (4-round) BMD-20, the 240-mm (12-round) BM-24, and the 250-mm (6-round) BMD-25, are seldom seen in front-line units. Although the BM-21 rockets are smaller in caliber than previous models, the warhead is equal to that of the 140-mm rocket, and the range exceeds that of the older 140-mm and 240-mm models. Due to the smaller caliber of its rockets, the BM-21 also can fire a greater quantity of rockets than the earlier models, making it especially useful for area fire and delivering massive surprise fires. The BM-21 is found in the rocket launcher battalion organic to each motorized rifle and tank division. It also has been used at front and army level, where it was replaced by the 220-mm rocket launcher (16-round) BM-27 in some units. BM-21V: 12-round launcher (V standing for vozdushnodesantii - Airborne -- NATO designator M1975) system was developed for use by Airborne composite artillery battalions. The BM-21V fires the same rocket as the BM-21 and BM-21-1. Sakr-18: Egyptian 40- tube 122mm MRL based on the Soviet BM-21. It has a range of 20 km carrying a 23 kg cluster munition. RM-70: Czechoslovakian 40-tube version -- The Czechoslovakian Army introduced this new version with the BM-21 launching apparatus mounted on a modified 10-ton TATRA 813 (8x8) truck in 1972. Although the basic launcher is almost identical with that of the Soviet BM-21, the transport vehicle is entirely different. Notable are the armored cab and the provision for carrying an additional 40 rockets. The reload pack of 40 additional rockets is located between the launcher and the armored cab, allowing the reload time to be reduced to 1.5 to 3.0 minutes. 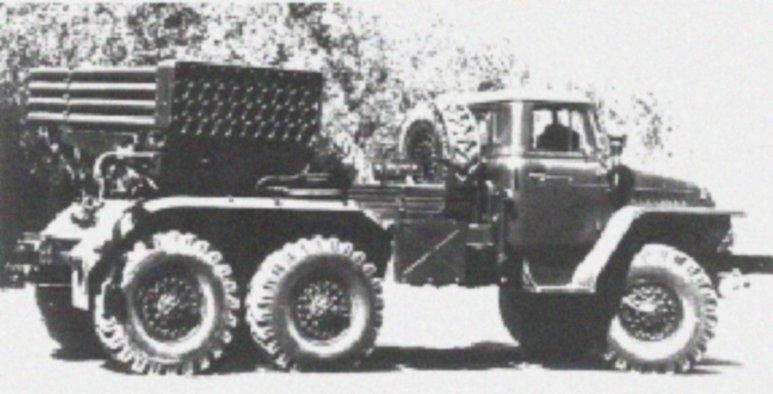 Although this combination is larger and heavier than the Soviet BM-21 on the Ural-3750 truck, it has the same road speed and a similar cruising range (600 km). It also permits greater tactical flexibility due to the additional rocket supply. This variant, known as the M-70, entered service in at least Czechoslovakia and East Germany.